Muhammad Yahya is three, and lives in Keighley with his parents and his three big brothers. He was born with spina bifida, hydrocephalus and talipes, and had a shunt inserted as an infant. This is his story, as told by his dad, Shazad. However, the family face challenges as a result of raising a disabled child. 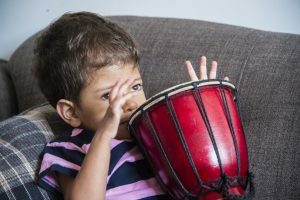 “I think there are significant barriers, for families like us, especially in terms of access to the equipment that he needs. There are charities which can help with funding but I feel we shouldn’t have to do that, the financial pressures of having a disabled child are huge and there are companies who make the equipment that we need for our son, who take advantage of the situation.” Recently, the family had to apply for charitable funding for a specialist buggy for their son, as wheelchair services could only supply a wheelchair or a buggy, and not both.